This audiophile demonstration album contains 11 tracks, including a microphone comparison, the giant organ at Temple Church, and a fantastic drum solo, which will test your loudspeakers to the limit! A vast selection of music which should take you and your Hi-Fi system on an interesting journey. This audiophile demonstration recording samples classical compositions by Vivaldi, J.S. Bach and Corelli, alongside a drum solo improvisation, a choir performance, microphone comparison of male voice recording, rehearsals, and more. Chasing The Dragon presents to you Chasing the Dragon II. 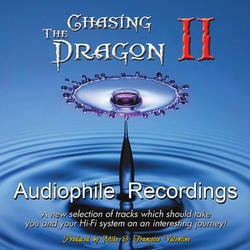 Chasing the Dragon has become known as one of the leading producers of audiophile recordings.